Thank you Mike, for the opportunity to grace your Blog, as a writer I appreciate every chance to get my material out there. At this moment, I‘m sitting in my studio looking upon a winter landscape of gentle snow blanketing the valley and dusting Douglas Fir and Red Cedar across the way. It is quite a restful and pastoral scene. The late afternoon shadows extend fingers across otherwise brilliant frosty vistas, pointing at a small flock of sheep huddling against the cold. For everywhere else in Canada this would a typical December day, however, I am in a suburb of Victoria, BC the center of Canada’s banana belt. We rarely see frost during daylight, let alone snow. I’m no stranger to snow having lived on the East Coast and in Ottawa, but at sixty something the first snow of the season is still exciting. I guess a little part of me never grew up. I have fond memories of Halifax, snow up to my armpits. Mind you, I was a little short of five foot at the time. As a navy brat my clue that snow was arriving was when Dad’s ship cast off for maneuvers near Bermuda. He would be gone for weeks at a time and Mum was left to raise us, being a grass widow was the term she used. Skype didn’t exist so Mum was unable to vent her frustrations live-time; she wrote lengthy letters. The post cards of tropical beaches received in return didn’t do much for her morale. My first bit of literary production came during one of these Eastern blizzards. As usual, Dad was at sea, and Dartmouth was shut down. Confined to barracks, I was beginning to exhibit early signs of cabin fever. My sister was about five, in other words more nuisance than playmate. At her wits end, Mum plunked me down in front of a window with pencil and foolscap and told me to write her a story about what I could see outside. My description of the neighbour’s house led into a speculative narrative about what my buddy John, stranded within, might be doing. Eventually this morphed into an adventure tale of what we would do once the wind and snow ceased. I now write thrillers, both contemporary and set in historical scene. My muse comes from current events, spiced with background as a retired cop and former intelligence analyst with the RCMP counter terrorism section in Ottawa. I have always been a keen observer of human interaction and current on world affairs, a gift inherited from my Dad. Dad was a cold warrior and his career took us to some interesting places such as Key West Florida on the eve of the Cuban missile Crisis. It was no surprise to family then, when my policing career led into counterterrorism. This blend of military and police backgrounds is what drives my story telling. 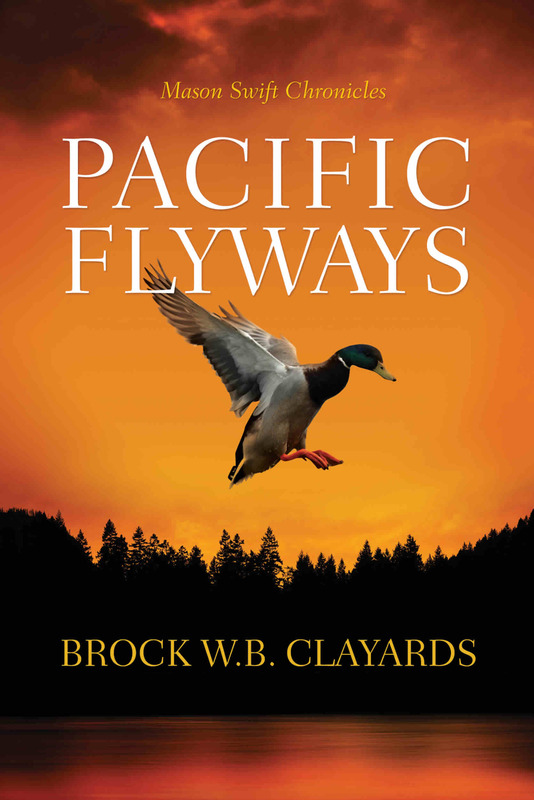 My first novel, Pacific Flyways, is available as E book at most electronic retail outlets. My second novel, Chasing The Dragon’s Tail, should be out in hard copy this spring. Check my Blog, brockclayards.com, for updates.